One mistake many mistake many people make when they’re buying their first guitar is buying a very cheap instrument because they aren’t sure if they or their child will stay with the guitar. Unfortunately, many of the more “affordable” options won’t be well-built. The strings may be too high, the tuners might not work properly, or some of the notes may be out of tune on different parts of the neck. It’s certainly possible to get a decent guitar without clearing out your bank account if you take your time while researching and purchasing. Always remember, there is no replacement to playing a guitar in person. No two acoustic instruments will ever be the same even if they’re the same model. The first thing to look for when buying a classical guitar is the size. Classical guitars will come in ½, ¾, 7/8, and full-sized models. Playing a guitar that is too large or too small can be frustrating for a student. It can also create bad habits that will hurt them musically and sometimes physically. Ideally, the player would sit down with different sized guitars. They should be able to comfortable play the first fret of each string without unnecessary strain. If it looks like they are straining to play the first fret, the guitar is too large. It’s also important to pay attention to the action, or string height on the guitar. Traditionally, classical guitars were built without using truss rods which allow a repair person to easily adjust the neck and raise or lower the string height. The higher the strings are from the neck, the louder the guitar is. However, a guitar with high action can be very frustrating and painful for a student to play. Many of the guitars on this list will feature a truss rod. If you are able to test guitars before purchasing them, make sure the strings are at a comfortable height from the neck. If not, most guitar stores will have a repair person on staff that will be able to make the adjustments for you. The next thing to look at is the wood being used. Beginner guitars will feature either solid or laminate wood. Solid wood means that the wood has been cut from a single piece of wood. Laminate wood, on the other hand, is many pieces of thin wood glued together. Solid woods will be louder and produce a better tone but are much more fragile than laminate woods. It’s important to properly care for an instrument with solid woods but keeping them humidified and temperature controlled. Laminate woods are much more durable. They are less prone to cracking and don’t require as much attention. They can still have a good tone but they usually don’t “open up” as much as solid woods do. Classical guitars will also employ various species of woods which will all make a difference. The soundboard will traditionally be made of either spruce or cedar. Most people consider spruce tops to be brighter and have more separation. Visually spruce is lighter in color. Cedar tops will often have a warmer tone and will be visually darker. The back and sides of a classical will be made of a variety of materials. The most common woods are rosewood and mahogany. However, there are also a variety of woods used that are very similar to Mahogany like Sapele, Meranti, or Catalpa. Rosewood tends to be visually darker than Mahogany and have more interesting grain patterns. Tonally, Rosewood produces a warmer, fuller sound. It is usually the preferred wood in classical guitar but will often add a little bit to the price tag of the instrument. There are some finishing touches that can add a lot to the guitarists playing experience. Perhaps the most important would be the nut and the saddle. The nut is the small white piece on the top of the neck and the saddle is the small white piece near the other end of the strings. They’re responsible for transferring the vibrations of the strings to the rest of the instrument. The denser the material, the better the tone. The best material used for the nut and saddle is bone. Usually bone nuts and saddles will be reserved for guitars at a higher price point but some brands, like Cordoba, are offering it on their beginner to intermediate level instruments. Other options will be synthetic bone or plastic. One of the last things to look at when purchasing a classical guitar is the finish. The finish is some form of coating placed over the wood to protect the instrument and give it a more completed appearance. Loosely speaking, most companies will either use a gloss finish or a satin finish. Gloss finishes will often (but not always) appear on the more expensive instruments. It offers the most protection to the instrument and has a shinier appearance. Although it does a great job keeping the guitar safe, it is thicker than a satin finish and can weigh down the tone. Satin finishes, on the other hand, are a lighter finish. They don’t have the same shine as a gloss finish. They also offer less protection but can give the guitar more protection and tone. Ibanez is best known for their electric guitars but they also make some great acoustics. 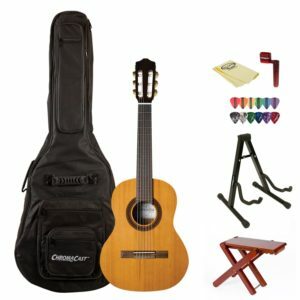 GA1 is a half sized classical guitar that is best suited for very young players. It’s difficult to create a ½ sized guitar that doesn’t feel like a toy or have intonation issues but Ibanez has shown that it’s possible. It has a laminate spruce top and catalpa back and sides. The laminate wood, paired with the gloss top, help to create a very durable instrument which is exactly what you want when it’s being held by young, and sometimes clumsy, hands. Its affordable price makes it the ideal guitar for a young student to try out guitar. If the student decides to continue, they can purchase a nicer ½ size or move up to the ¾ size without losing a lot of money. Very few people would argue that the Cordoba Requinto is the best half sized classical guitar on the market right now. Make no mistake, this is an impressive instrument that can work equally well as a beginner guitar or a “traveler” when it is outgrown. It has a solid cedar top, and mahogany back and sides. It also features a bone nut and saddle, Torres style fan bracing, and a gloss finish. The 47mm nut width is very comfortable for smaller hands. It’s a bit more than many people would expect to spend on a half-sized guitar but it’s well-built, easy to play, and has a great tone. The Hohner HCO3 is a great guitar with a good price. This is a ¾ size guitar that is ideal for younger, shorter players. It features a laminate spruce top and laminate catalpa back and side. Unlike many guitars in this price point, the Hohner HC03 is very well-built. The action is comfortable, the tuners function very well, and these guitars won’t fall apart anytime soon. Furthermore, the tone and volume on these guitars is surprisingly strong. The Cordoba Cadete is another ¾ sized guitar. If you’re able to jump up a little bit in price point, you’ll get a few features that will really improve the quality of your instrument. The Cordoba Cadete features a Cedar top and Mahogany back and sides. A really nice surprise is that Cordoba is even including a bone nut and saddle. They’ve done a great job in maintaining the Cordoba tone at an affordable price. The Cadete also includes some nice aesthetic features including rosewood binding and gold tuners with pearl-colored buttons. The Cordoba Dolce is another good option for the player that isn’t quite ready for the full size classical but has outgrown the ¾ sized guitar. At 50mm, the nut width is slightly smaller than standard which can make difficult barre chords more accessible for smaller hands. The bone nut and saddle, solid cedar top, Indian Rosewood back and sides, and traditional Spanish fan bracing ensure quality tone. Not many people think of Washburn when they think of classical guitars but they’ve shown that they can compete with some of the more traditional names with their C40. It has a spruce top and mahogany back and sides. It also is the cheapest model to feature a bone nut. The guitar has a great, full sound with a lot of sustain. If you want to try to be able to test your new classical before you buy it, it could be easier to find a store that carries Washburn (which makes a variety of instruments) than a brand like Cordoba which specializes in classical guitars. The Yamaha C40 is a good full-sized classical for anybody that wants to dip their foot into the world of classical guitar. It’s a no-frills piece but it’s very well-crafted and durable. It’s built to traditional Spanish specifications so the player can develop proper playing technique. The C40 features a laminate spruce top and meranti back and sides. It has a gloss finish which offers more protection than the satin finish seen on other models in the same price point. 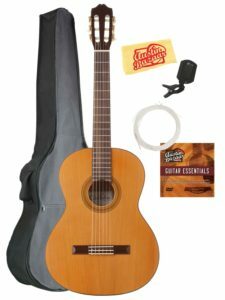 The Cordoba Protégé is a full-size traditional nylon guitar. It has mahogany back and sides paired with a spruce top. This is another great instrument for a young musician just getting into the world of classical guitar. It’s a little quieter than some of the other models but doesn’t sacrifice on tonal quality. They make this model in ¾ and full size. This can be a nice feature if you want your student to have a sense of consistency while they develop into and bigger guitars. The Cordoba C3M is an affordable entry into the full-sized classical guitar. Even at its entry-level price, it still features some really great specs. What’s probably the strongest feature is the solid Canadian Cedar top. The back and sides are mahogany and the guitar is protected by a satin finish. Like the other Cordoba models, the C3M sports a bone nut and saddle. The Yamaha CG 122 is a nice step up from the Yamaha C40. It offers more variety than other models. The player can actually choose between either a solid spruce or solid cedar top. The back is nato, which has similar tonal characteristics to mahogany. It features a satin finish which does a nice job opening up the sound. If you’re willing to spend a little more money, this guitar will offer more volume and tone than the C40. The Takamine CG5 is a more dressed up guitar than some of the others on the list and has the sound to back up its good looks. It features a solid, fan-braced spruce top with rosewood back and sides. The neck is mahogany and connected through the traditional, dove-tail joint. It also features gold tuners and a rosewood fingerboard. The rosewood veneer on the headstock is a subtle feature that adds a sense of completion to the overall appearance of the CG5.